Nothing like ordering room service when your hotel is fitted with fine mahogany doors! While mahogany has been used in American colonial furniture since it was imported from the southern Caribbean, it continues to add grace and opulence in today's offices, governmental buildings, and upscale hotels. This rosy hardwood is precious enough to use in fine furniture, musical instruments, and other applications where a straight, unblemished grain is essential to the crafts worker. 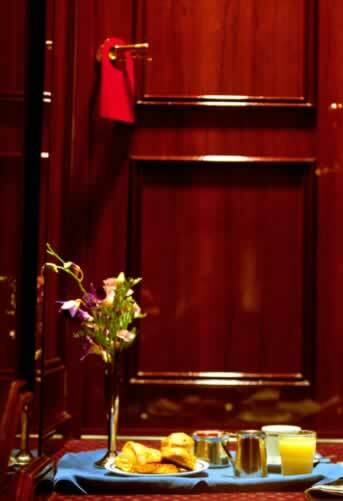 Mahogany doors, when polished and maintained, hold an exceptional luster and warm up any room. It's not the least expensive of the many hardwoods used in contemporary doors, but it may be simply the most elegant sheen of them all. Add copper or brass hardware to dress out the portal the way it was optimally intended by New World carpenters.